Man, the Dolphins of 1984 were ridiculous in winning the AFC Championship 45-28, with a record 4 TD passes over the Pittsburgh Steelers and now it’s on to Super Bowl XIX…Dan Marino, The Marks Bros. would make it to many more Super Bowls…wouldn’t they? Talk about a whirlwind ride, easily the greatest offensive ride a team has ever gone on. When Dan Marino threw for 5,084 yards (record) and a record 48 TDs in 1984 he broke the old record of 36, last done in 1963. That’s the equivalent of someone breaking LaDanian Tomlinson’s 31TD record and going for 42!! Shatter isn’t the word. After replacing the late David Woodley in mid 1983, Marino made the Pro Bowl w / 20 TDs and the future looked bright. However in his 1st full season as a starter he blew past expectations and beneficiary of all this passing were receivers Mark Duper, Jimmy Cefalo, and Mark Clayton who set the receiving TD record at 18. They scored 70TDs (record) as an offense and what is ironic is how anemic this offense was just 2 years before in Super Bowl XVII when they could only complete ONE pass in the second half in losing to the Redskins. They masked a defense that was in decline…the Killer B’s were quickly losing their sting and points were pouring in on the Dolphins. They were not a heavy defense and were wearing down from pounding and age. A.J. Duhe, Kim Bokamper, Doug Betters, and Bob Baumhower weren’t as stout as they had been a few years before. They did lose a good linebacker when Larry Gordon passed away while jogging in the offseason. Jay Brophy had been drafted to help shore things up but was just learning the pro game at this point.. The defense had been comprised of the same personnel primarily from 1979-1984. The Dolphins were due to rebuild however the emergence of Dan Marino allowed this team another shot at a title. 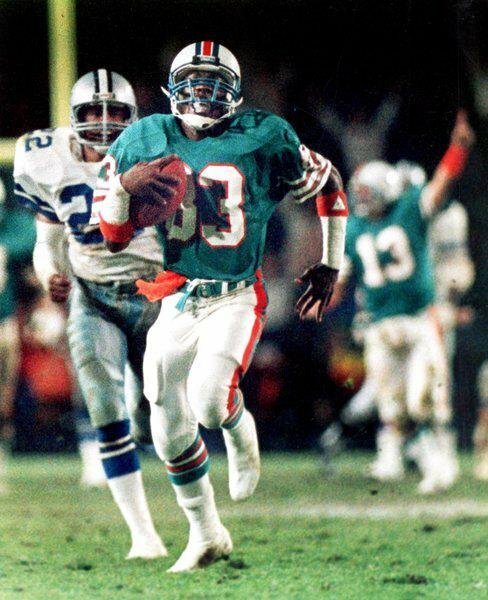 Going into the 1984 season, the Dolphins hadn’t recovered from the death of David Overstreet at running back yet. Tony Nathan was a good pass catcher out of the backfield. 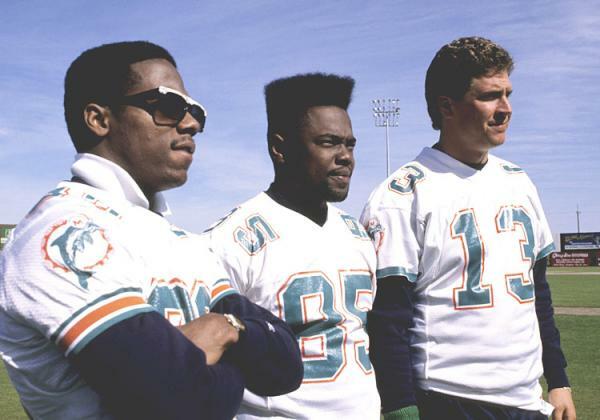 Marino, Mark Duper, and Mark Clayton kept the rhythm they gained from playing on the Dolphins scout team early in 1983 and unleashed it on an unsuspecting league. 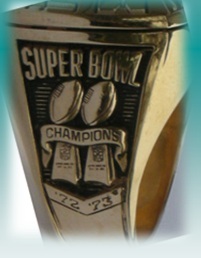 The season began in Washington where the Dolphins in a rematch of Super Bowl XVII some year and a half earlier. Where they could only complete 1 pass in the second half of that game, Dan Marino scorched the Redskins for 5 TDs and 370 yards. One of the best defenses in football was embarrassed at home. There was no way for him to keep with that pace. Another notable game was a game in November v. the defending champion Raiders with cornerbacks Lester Hayes and Hall of Famer Mark Haynes. You remember them right? Totally shut down the Redskins in Super Bowl XVIII, surely they would slow him down…uh…they didn’t. Marino threw for 470 yds and another 4 TDs which included his record breaking 37th of the season to Jimmy Cefalo. He bookended his record setting season on a Monday night, where he threw for 3TDs in eliminating Dallas from the playoffs for the first time since 1976. The last second 70 yd touchdown to Mark Clayton gave him his 18th TD reception on the season breaking the record of Elroy “Crazy Legs” Hirsch from 1951. They were able to easily outscore their competition in marching to an 11-0 start, finishing 14-2. When you include the playoffs, Dan Marino threw for 57TDs! Yikes! Started with a blowout of the Seahawks in a playoff rematch where he threw for 4 more TDs then the 4TDs against the Steelers in the AFC Championship Game. That broke George Blanda’s AFL Championship Game record of 3 from 1963. Yet here they were, AFC Champions for the 5th time, heading to Palo Alto for the Super Bowl what could go wrong?? 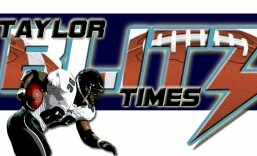 The 49ers were prepared to pressure the receivers and had the secondary to play with them and triumphed 38-16. Let’s look at the all time touchdown record a second…Brady had 50 touchdown passes, Peyton Manning 49, and Marino 48. Brady set the record in his 8th season with the 3 time champion Patriots marching to a 4th Super Bowl appearance. Peyton Manning had set it in his 7th. Both were veterans that had been in systems for years where Marino was in his first full season as a starter. Brady and Manning had players drafted that fit what they did where Dan came up with the 3rd string receivers and they all became stars. In Manning’s case he had Marvin Harrison who set the record for receptions in a season at 143 the year before, a Hall of Fame talent. Brady had future Hall of Famer Randy Moss to throw to. To break Marino’s record as strongly as he blew by the old one, Brady would have had to have thrown 64TDs. I still hold Marino’s season WAY higher than those others it was more spectacular and impactful. 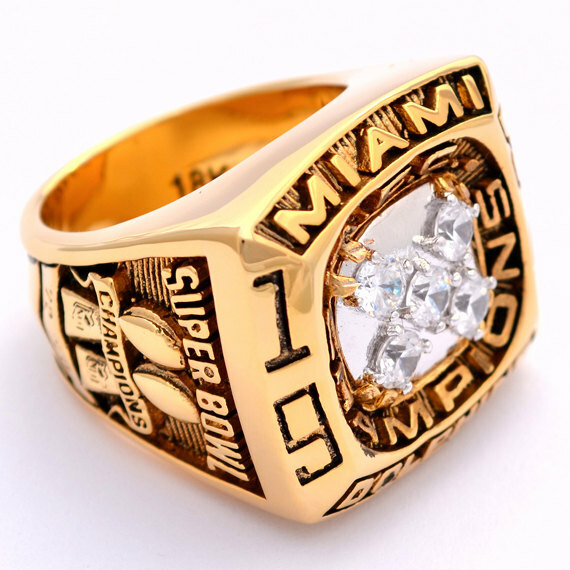 However here is the ring for Don Shula and the Dolphin’s 5th AFC Championship…what a magnificent run.